It's still too early for the butterflies and bees to make an appearance, so I'm just going to have to make my own until they do! Mr. Big got a little workout today, not only with the die cuts, but the butterfly embossing as well. Honestly, I don't know if I could make cards if I didn't have a Big Shot! The Dazzling Diamonds Glimmer Paper is just that - dazzling! The photo above just doesn't do it justice, so I laid it in a shaft of sunlight to give you an idea. Still not as dazzling as real life, but you can get an idea. It's so purty! 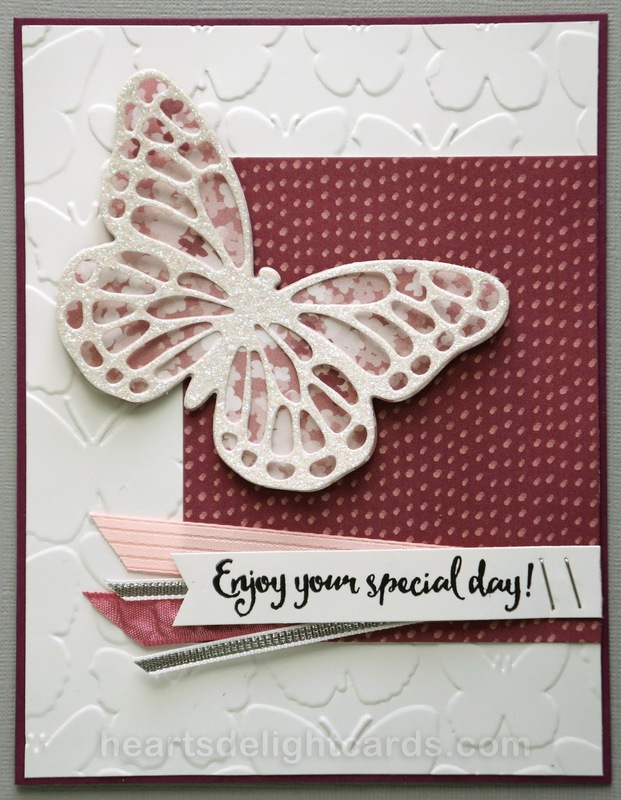 Butterfly: Blooms & Bliss DSP 2-1/2" x 3-1/2" and Dazzling Diamonds Glimmer Paper 2-1/2" x 3-1/2"
DSP background: Blooms & Bliss 3" x 3-1/2"
Greeting: Whisper White 1/2" x 3-1/2"
Card base: Rich Razzleberry 5-1/2" x 8-1/2" scored & folded at 4-1/4"
Die cut butterfly DSP using Bold Butterfly Framelits die. Die cut Dazzling Diamonds Glimmer Paper using coordinating Butterflies Thinlits. Adhere together using liquid glue just on the butterfly body. Note: The Precision Base Plate ensures a clean cut through glimmer paper, but be sure to run it through twice to make sure! 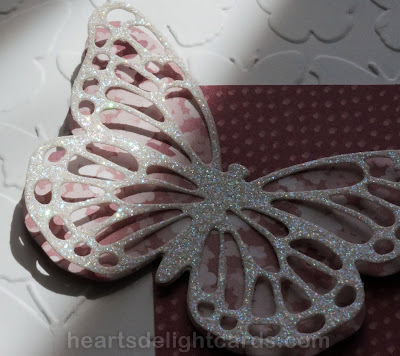 Emboss background with the Fluttering embossing folder. Adhere to card base. Stamp greeting on Whisper White strip, leaving room on the right for staples. Cut banner end on left side. Cut 4" of Blushing Bride and Sweet Sugarplum ribbons and trim left ends at an angle. Cut 8" of Silver ribbon, fold in half and cut ends at an angle. Stack the ribbons as shown, with greeting on top, and staple to right side of DSP near the bottom. Adhere DSP to card base.